He was the illegitimate child who became a war hero. John Kenneally’s act of World War Two bravery was even recounted by Winston Churchill in one of his famous speeches. Born in Birmingham, he showed no thought for his own life to charge alone towards a company of Panzer Grenadiers holding a mountainous position at Djebel Bou, in Tunisia. The Irish Guardsman ran forward, firing his machine-gun from the hip, his bravery so breathtaking that the Germans all fled. For most, that act of bravery would be enough to last a lifetime. Not Kenneally. Just two days later, the soldier – this time accompanied by a non-commissioned officer – again launched a seemingly suicidal charge. This time the brave Brummie did not come through unscathed. He was hit in the leg, the wound only becoming apparent to colleagues when he was seen limping from one position to another, propped up by a fellow Guardsman. But what of the man who carried out one of the war’s greatest acts of bravery? His roots could not have been more humble, and they remain shrouded in mystery. Because, for a start, Kenneally was NOT his real name. He was born Leslie Jackson at 104, Alexandra Road, Balsall Heath – at the time a notoriously rough quarter of the city – on March 15, 1921. His mother was Gertrude Nowell Robinson, the teenage daughter of a Blackpool chemist, who had been despatched to the West Midlands after falling pregnant. It was rumoured that the child’s father was a wealthy Manchester textile boss. To avoid disgracing her family, Gertrude changed her name and became a dance hostess. The rich, but absent, father at least did not scrimp when it came to providing cash for the infant. His maintenance money paid for Kenneally’s private education at Calthorpe College, where he was the sole street urchin in a class full of privileged pupils. Kenneally later attended Tindal Street Junior School, then King Edward VI Five Ways School. His early army career was less than auspicious. He joined the Territorial Army’s Honourable Artillery Company on his 18th birthday and was assigned to an anti-aircraft battery. But after overstaying a period of leave, Kenneally was sentenced to detention at Wellington Barracks. His warders were Irish Guardsmen and Kenneally was so impressed by their bearing and discipline that he requested a transfer to the regiment when his punishment was completed. That request was rejected. Livid at being snubbed, he turned his back on the Army and linked up with a band of itinerant Irish labourers who worked their way to Glasgow. Incredibly, one of the war’s greatest heroes spent his service living a lie. He was, to all intents and purposes, guilty of identity fraud. He was not only not who he said he was but he also had no Irish blood in his veins. But he was proud of his association with the Irish Guards, nicknamed The Micks. “It was a hard school to learn in,” he later recalled. “Without being over-sentimental, men can love each other. Kenneally’s toughness and fighting spirit soon came to the fore. But even those close the lance corporal were stunned by the man’s total disregard for his own skin. On April 28, 1943, Kenneally and fellow Guardsmen were tasked with taking The Bou, a rocky parcel of high ground that dominated the parched landscape between Medjez El Bab and Tebourba. The Bou had to be taken if the assault on Tunis was to be successful. A 200-strong Guards brigade managed to capture a small part of the stronghold – Points 212 and 214 to the west – on April 27, sparking a furious Nazi counter-offensive. Those Irish troopers pinned down on The Bou were told to stand firm at all costs while a push to take the whole area was being prepared. That cost was high. On April 28, one company of the Irish Guards, pinned down, prepared for a mass German attack. The men looked nervously on as the enemy organised its men for the big offensive. Whether something inside Kenneally snapped – a temporary madness caused by the hail of bullets – or he was simply fearless to the core, we will never know. He suddenly decided the time was right to attack the German positions on his own. To his colleagues’ disbelief, Kenneally charged down the barren slope, his Bren gun chattering. Stunned by the sight of a screaming individual running straight at them, the German soldiers broke ranks and fled. Unbelievably, on April 30 he repeated the feat. Accompanied by a sergeant of the Reconnaissance Corps, he again rushed at Nazi soldiers as the prepared for an attack, killing many of them. He got a bullet in the leg for his troubles, but refused to give up his Bren. Despite bleeding heavily, he continued to fight during the day. Kenneally was less than overjoyed by his Victoria Cross – because he feared the publicity would lead to his true identity being revealed. “It was the worst thing that could’ve happened to me,” he admitted. After Tunis fell, Kenneally was promoted to sergeant and was again wounded during fighting in Anzio in February 1944. When the war was over, the man with a big thirst for adventure volunteered for the newly formed 1st Guards parachute battalion. 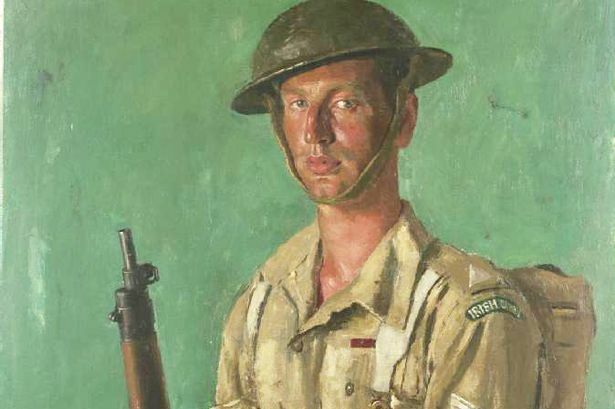 He served with distinction during the last days of British rule in Palestine. In July 1948, Kenneally bought himself out of the Army so he could be with his wife, Elsie Francis, and children. In Civvy Street, he settled for a life more ordinary and ran a successful garage in Worcestershire. He died on September 28, 2000, immensely proud to the very end of his regiment and the tribute paid by Winston Churchill. In Churchill’s 1945 ‘Five years of war’ speech, he stated: “When I think of these days, I think also of other episodes and personalities. “I do not forget Lieutenant-Commander Esmonde VC, DSO, Lance-Corporal Kenneally, VC, Captain Fegen VC, and other Irish heroes that I could easily recite, and all bitterness by Britain for the Irish race dies in my heart.